Breathing in a lot of Gujarat : Mumbai to Kutch, Gujarat | Horn please, OK? 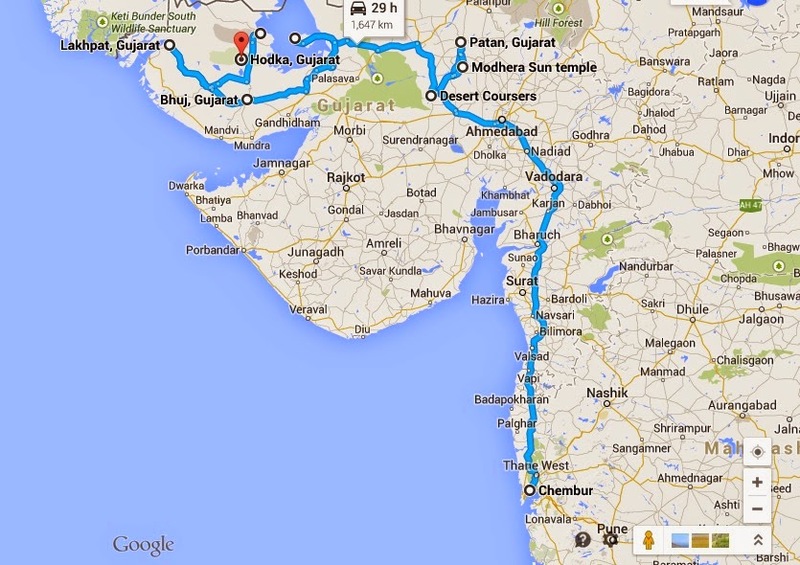 Ever since Mumbai became home again, we've been trying to make time for a road trip to Gujarat. All set to drive off in early December, a torn ligament fouled things up. Gujarat still on our minds, Big B's hypnotic voice over the radio coaxed us into making it happen. It was the first week of February and we were off to breathe in, not just a bit of Gujarat, but a lot of it. This may come as a shock to you but neither NaMo nor Amitabh Bacchan are personally there to greet visitors at the pearly toll gates of the Maharashtra- Gujarat border. But if you're lucky you'll get a smile from the toll gate operator. NH8 took us out of Mumbai towards Surat. A breakfast detour led us to Daman. Not very picturesque and still in partial slumber, Daman did not take our breath away. Breakfast options were limited but stay options weren't. There's a line of hotels to choose from on Seaface road, interspersed with hole-in-the-wall liquor shops all open at 9 am. So if you like your tipple with your breakfast cereal, this is the place to be. We spotted a sign outside Hotel Sovereign advertising an unlimited breakfast buffet for 80 bucks. We were sold. Google Maps, our inconsistent friend, took us down a couple of wrong roads before we made it back to the highway. NH8 is a dream to drive on. And its not just the quality of road. It was the way in which the rest of the traffic was conducting itself. Everybody was driving according to the rule book! All the trucks drove in a line in the left lane and used indicators to overtake (trucks with functioning indicators! ). The car drivers moved out of the way as soon as they spotted us in their rear view mirrors. No honking, flashing (no, not that kind either) or rude hand gestures were needed. Even the camels stuck to their lanes. It was the most stress-free driving we've experienced. On reaching Ahmedabad we circumvented the city and turned on to state highway 947 driving towards Viramgam. The road got progressively narrower and dustier as we made our way to Zainabad in Dasada. Our plan was to spend two nights at Zainabad and check out the Little Rann of Kutch (LRK) along with some surrounding sites at Patan & Modhera. Desert Coursers and Rann Riders are two of the better stay options near the LRK. We were leaning towards the latter since we'd heard good things about it but apparently so had a bunch of other people and they had had the foresight to make reservations. The place was booked solid. The website describes Desert Coursers as an eco resort. It definitely deserves the 'eco' tag with its mud huts and natural fiber upholstery. Calling it a resort would be a stretch. There were 36 mud huts in all with a couple of dormitories. The rooms were basic but very comfortable. They were colorfully done up using locally made fabrics and art. The bathrooms could have done with some repairs and cleaning but on the bright side, we were next to a dessert and had access to running hot water. One corner of the property had a kennel of sorts with a bunch of disinterested Irish Setters. Dinner was served in the common area where we bumped into our very hospitable and dapper host, Dhanraj. The evening was spent wolfing down a delicious dinner and chatting with Dhanraj and the other guests around a camp fire. A lot of them were bird watchers, not surprising since the LRK sees countless flocks of migratory birds making it their home every winter. One of the guests had captured the hatching of a baby Nightjar on his camera and was proudly showing around his photographs. We had a 630 am start the next day. The 650 km drive from Mumbai and the onset of a food coma sent us to bed early with dreams of cooing nightjars and bhakri eating Desert Foxes.